Burritt on the Mountain, located 5 miles east of downtown Huntsville is near the top of the famed Monte Sano, Italian for “Mountain of Health”, where the Hotel Monte Sano once stood. The mansion was built as a retirement home by Dr. William Henry Burritt, and was left to the city of Huntsville after his death to create Huntsville’s first museum. In addition to the mansion there is a historic park, farm animals to meet and trails to explore. Dr. Burritt was born in 1869 to a prominent Huntsville family. He attended Vanderbilt Medical School graduating in 1890 specializing in homeopathy, or natural medicine, like his father and grandfather before him. He returned to Huntsville to practice medicine and married his first wife, Miss Pearl Budd Johnson in 1892. Sadly, 5 short years later Pearl died from complications following surgery. A year after her death, Dr. Burritt was asked to treat Josephine Drummond, a guest of the Monte Sano Hotel. According to local lore, Josie, 13 years William’s senior, proposed and said if he would marry her and act as her personal doctor she would leave her considerable fortune to him. The couple married and moved to Josie’s home in St. Louis. The doctor spent 33 years in St. Louis and shifted his focus to rubber products creating a number of tire patents. Upon Josie’s death in 1933, Dr. Burritt began plans for his retirement home in Huntsville. The home was completed in 1936 and the day before the Doctor had planned to move in an electrical short caused a fire fueled by 2200 bales of wheat straw that had been used in insulation burned the new home to the ground. Almost immediately after the loss, Dr. Burritt began to rebuild. This time the straw was treated with a boric acid and borax solution to fire proof it and a significant amount of concrete including concrete-reinforced shingles were used. It is a beautiful building built in the shape of an “X” to allow windows on three sides of most rooms. Once you enter the home you have the choice of a guided tour from a docent or an audio tour. We choose the tour and learned some amazing anticdotes about the history of Huntsville as well as Dr. Burritt. The home tour will be interesting to older kids. Our kids looked around for a few minutes and then waited for us to finish in the entryway of the home. As you walk around be sure to stop and see Dr. Burritt’s custom car he had built with right hand drive so he could navigate the steep mountain roads. After the tour of the home we got some great pictures of the Huntsville skyline. You can see the rockets at NASA which are 10 miles away. Venture back past the visitor’s center at the entrance and you can explore the historic park which has buildings from the rural Tennessee Valley area in 1850 and 1900. Living history interpreters are located throughout the park and will tell you about life 100+ years ago with demonstrations of common ways of life at the time. Our kids had a great time visiting the animals (chickens, cows, donkeys) and playing games available in one of the buildings. They also enjoyed the swings and large playscape. It had rained the day before we visited and was still quite wet so we didn’t explore the trails. Both the Rock Bluff trail and the Oak Tree Trail start in the historic park area. Bathrooms are located in the visitor’s center along with classrooms for programs and a small gift shop. Picnic benches are available and you are welcome to bring a lunch. 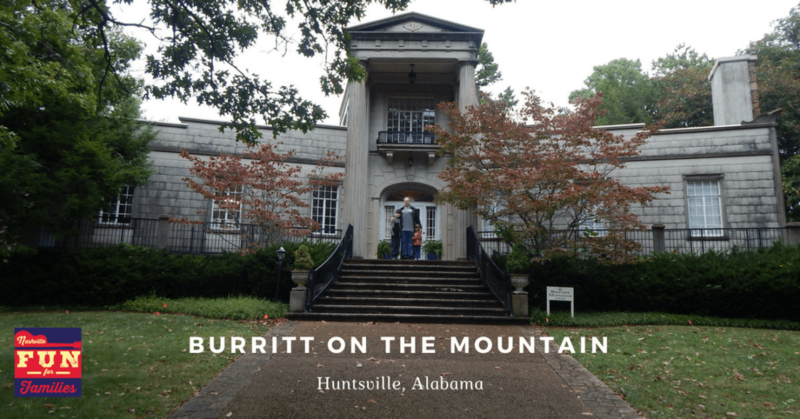 Disclosure: We were given tickets to visit Burritt on the Mountain by the Huntsville CVB. We appreciate their support of Nashville Fun For Families that allows us to spread the word of fun things to do in Nashville and beyond.